Crawley Town midfielder Filipe Morais admitted that Reds failed to deal with MK Dons' game plan during their 4-0 defeat this afternoon (Saturday). It came as the first defeat since Gabriele Cioffi took charge, with their previous loss at Broadfield Stadium coming in August, and Morais acknowledged the successful opposition tactics. He said: "It's difficult [to assess it]. I will need to watch it back. After a game like that, you really need to analyse it and look at yourself first and see where we went wrong. "I felt we had good possession of the ball but as soon as they won it back they had a clear game plan to go direct and hit us on the counter attack and we didn't deal with it. "You could definitely see they came with a game plan. They sat deep as they know we are strong at home and looked to counter which was similar to Exeter." 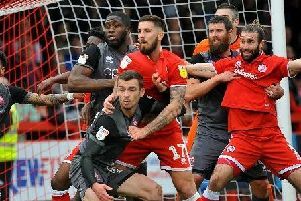 It was also the first time Crawley have failed to score in a home game since Boxing Day, and Morais admitted that the hosts didn't test the keeper enough. He added: "On the ball, we need to score and hit the target more. We had plenty of shots but haven't worked the keeper enough. With all the possession and play we had, we needed to hurt them more." When asked if MK Dons were the best team defensively Crawley have faced at home this season, he said: "Yeah, them and Exeter. Both of those teams are solid and well drilled. "We are a team in progress under the new gaffer. He's brought a lot of really good ideas but we are going to get these little blips but we just need to figure out where we went wrong. The key is to learn from them." Despite the heavy defeat, Morais claimed it 'wasn't a 4-0 game' and was an improvement on the 5-1 defeat at Tranmere. "I didn't feel today was like the Tranmere away game. That was a lot worse, he said." "I didn't think it was a 4-0 game, it didn't feel that way at all, but at the end of the day, it is, and we need to take responsibility as players, address it and do the best we can. "We really have to look in detail at ourselves first and foremost and look what we can do better as a team. "We need to find a way to win these games and stick together. We win together and we lose together."